Open Architecture in Beijing: Li Hu would like architects to reconsider the concepts their cities are built on. Atelier Liu Yuyang Architects in Shanghai: Liu Yuyang talks about the urban development of Shanghai and the principle of China’s urbanization. 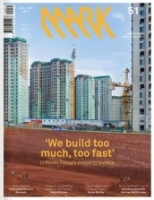 Li Xiaodong Atelier, Beijing: Li Xiaodong doesn’t think that high-rises and organically shaped museums is the way for Chinese architecture to move ahead. Jiakun Architects in Chengdu: Liu Jiakun has found a way to deal with the lack of craftsmanship in the construction industry. Architectuurstudio HH in Utrecht, The Netherlands: Those who are not put off by the outer appearance of the new music palace will find a temptation-filled temple inside. Neutelings Riedijk Architects in Amersfoort, The Netherlands: The architects wrapped a cultural centre in an undisguised reference to George, the city’s patron saint. Groupies in Venice, Italy: Our reporters explore group dynamic, team spirit, social interaction and politics at the Architecture Biennale. Zaha Hadid Architects in Honk Kong, China: The starchitect’s Innovation Tower provides its students something of the subtlety and complexity of a natural landscape. Adamo-Faiden Architects in Buenos Aires, Argentina: Sebastián Adamo and Marcelo Faiden aim for an architecture that is rooted in society while also producing friction. Guedes Cruz Architects in Alcadideche, Portugal: A retirement home for former bank employees that might resemble a series of mausoleums. Searching for Masahiro Ikeda in Japan: Sergio Pirrone looks for the genius structural engineer behind Japan’s experimental architecture of the previous decade. Studio Odile Decq in Lyon, France: The architect’s latest office building takes its cues from steel-truss bridges and cranes. MBA/S in Stuttgart, Germany: The first house in the country to be built out of thermally insulating concrete. Aaron Betsky in Cincinatti, USA: The way we live in books can be as vivid as the way we live in physical structures.